← The new raw food pralines! You will be amazed at the difference in terms of taste between freshly squeezed juice and juice from the shop, and at the diversity of variations you can make. If you squeeze the juice yourself you not only have the pleasure of a unique taste, but also the benefits of the natural vitamins, minerals, trace elements and valuable enzymes. It takes no more than just three large, crunchy apples to give you half a litre of fresh and delicious juice. These rich nutrients in raw food quality which are contained in fresh juice help you stay healthy! Norman W. Walker, the famous juice therapist, was so fit that he was still writing books and riding a bike when he was almost 100 years of age. He swore by freshly squeezed juice in raw food quality and lived a long, healthy life. Why not decide for yourself what you drink? If you make your juice freshly yourself, you can be sure that no unripe fruit or, worse still, bruised parts go into your juice. You will know that your juice is genuinely fresh and has not been stored for months and exposed to bright light. And you also have the certainty of knowing that your juice does not contain any additives. It all depends on the method! According to a scientific study, the enzyme content of a juice depends on the amount of oxygen that is drawn in during juicing and pressing. The greater the amount of aggressive oxygen that enters the juice, the larger the number of valuable vital nutrients, such as enzymes and vitamins that are sensitive to oxygen, that are destroyed. 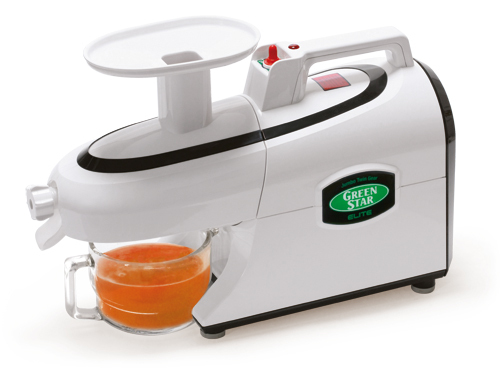 Most juice extractors you find in the shops operate at extremely high rotational speeds. At speeds of up to 16,000 rpm, large amounts of oxygen are drawn into the juice. Here the produce is crushed by a rotating auger and then squeezed against a screen. Finally, the Champion Juice Press / Champion Juicer works on the basis of a cutter cylinder with stainless steel blades that rotate at 1,400 rpm to finely shred the fruit. The juice contained in the fruit is then squeezed and filtered through a screen. All three juicing methods produce highly aromatic fruit, vegetable or cereal grass juices with a rich colour and full-bodied flavour. The body is capable of absorbing these fresh juices very quickly, for an energy boost that you feel straight away. Read the article about Vitamin C in raw food quality as well!